PROPERTY OVERVIEW >> $420pw -- Price incl. 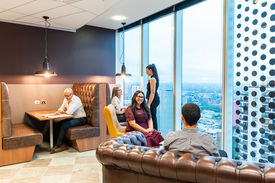 A collaborative managed space on Adelaide’s Flinders Street, this vibrant office features cutting-edge design with serviced offices, meeting rooms and event space plus 24/7 access and bike storage. 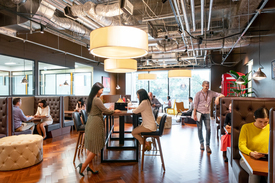 The workspace occupies three floors with offices and collaborative areas, all with fresh contemporary decor, modern fit-outs and a strong focus on creating a close working community. 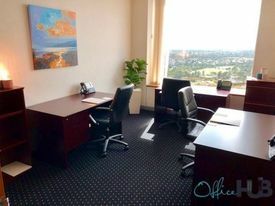 Situated to the north-east of Adelaide’s CBD, this office space is within a beautiful heritage listed building with original features throughout. 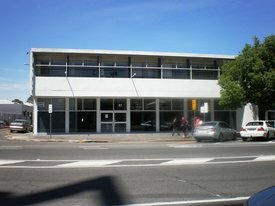 On-street parking is available nearby and Adelaide’s public transport options are within close proximity. Our favourite feature at this office building is the funky roof terrace with gorgeous views, perfect for a casual meeting with a colleague or an evening team bonding session with a beer.